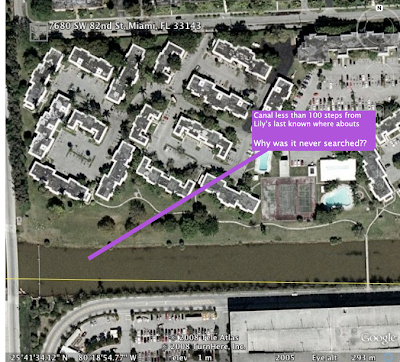 This is the view of the area where Lilly disappeared from, her “fiance’s” apartment in South Miami. There is a canal less than 100 steps away (it’s towards the bottom of the image) yet police have NEVER thought to look. Almost a year since Lilly vanished into thin air. Please read the article below and comment on Susan’s blog. We have the possibility of getting the case on Nancy Grace if there’s enough feedback and interest from you all. We DEMAND Justice in Miami. The question has been asked, what will your answer be?